Millennial voters continue to have the highest proportion of independents of any generation. But when their partisan leanings are taken into account, they also are the most Democratic generation. More than four-in-ten Millennial registered voters (44%) describe themselves as independents, compared with 39% of Gen Xers and smaller proportions of Boomers (32%) and Silents (27%). However, a majority of Millennials (59%) affiliate with the Democratic Party (35%) or lean Democratic (24%). Just 32% identify as Republicans or lean toward the GOP. Partisan identification is more evenly divided among older generations of voters. Nearly half of Gen Xers (48%) identify as Democrats or lean Democratic, while 43% identify as Republicans or lean Republican. Among Boomers, roughly equal shares identify with or lean toward both parties (48% Democrats, 46% Republicans). 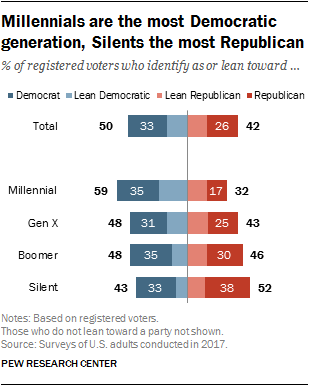 The Silent Generation is the only generation in which, on balance, more registered voters identify as or lean Republican (52%) than identify with or lean Democratic (43%). With the midterm election still more than eight months away, Millennials express a strong preference for the Democratic congressional candidate in their district. By greater than two-to-one (62% to 29%), more Millennial voters say, if the election were held today, they would vote for the Democrat in their district or lean toward the Democrat than prefer the Republican candidate. Among older generations, about half of Gen Xers (51%) say they would vote Democratic, while 41% would vote Republican. Boomers and Silents are more divided in their early voting preferences. 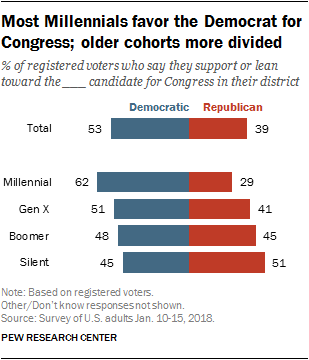 The gap between Millennials and other generations in the midterm congressional vote is wider thus far in the 2018 cycle than in previous midterm years. Millennial voters have generally favored Democrats in midterms, and that trend continues. But, comparing early preferences this year with surveys conducted in previous midterm years, Millennial registered voters support the Democrat by a wider margin than in the past. Among older generations, voters’ midterm choices in 2018 are more similar to recent midterms. Gen Xers support the Democrat in their district, 51% to 41%; they backed the Democratic candidate by a comparable margin (49% to 40%) in surveys conducted in 2014. 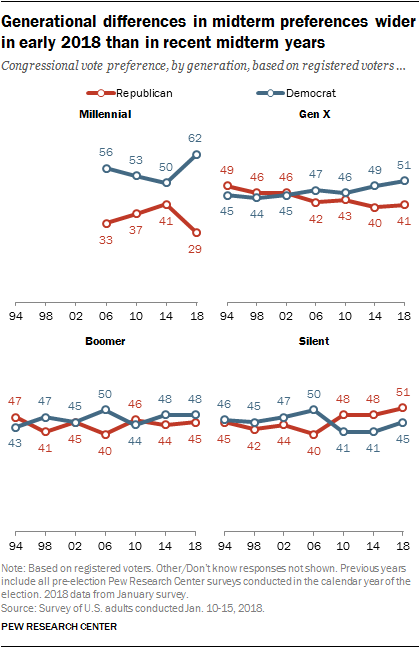 Similarly, the early 2018 preferences of Boomers and Silents mirror their opinions during the 2014 midterm. Millennials’ early interest in this year’s midterms is greater than for the past two congressional elections. 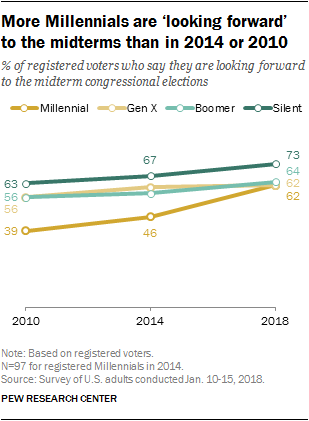 This year, 62% of Millennial registered voters say they are looking forward to the midterms; at similar points in 2014 and 2010, fewer Millennials said they were looking forward to the elections (46% in 2014, 39% in 2010). There has been less change among older generations. This year, 73% of Silents, 64% of Boomers and 62% of Gen Xers say they are looking forward to the midterms. 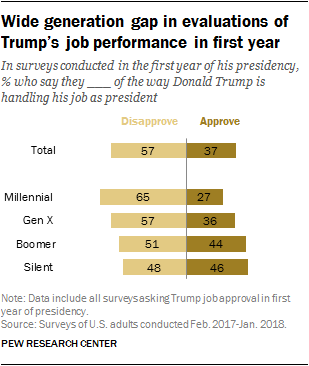 Trump’s job approval is more negative than positive among Millennials, Gen Xers and Boomers, based on Pew Research Center surveys conducted over the first year of Trump’s presidency. Nearly two-thirds of Millennials (65%) disapprove of Trump’s job performance, while just 27% approve. Among Gen Xers as well, a majority (57%) disapproves of the way Trump is handling his job as president, compared with 36% who approve. Boomers are more divided in evaluations of Trump’s performance; still, somewhat more disapprove (51%) than approve (44%). Silents are divided in opinions about Trump’s first-year job performance (48% disapprove, 46% approve).